Chili is one of those dishes where you really can't go wrong. I've tried a few different recipes and I put this one together based on what I found out I liked the most. Plus, it's all done in my slow cooker so I can put it all in before I leave for work and come home to a delicious smelling house! But don't fret...even if you don't have a slow cooker you can simmer it on your stove top in a regular saucepan. Whew! 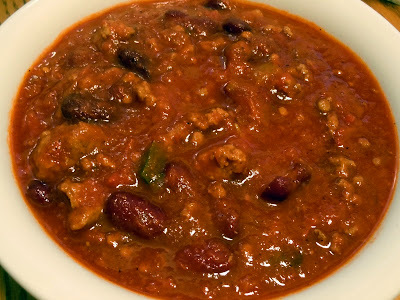 I used dark red Kidney beans in mine, but you can definitely use light red or a different bean altogether. You can even leave them out if you really want to. Top this with cheddar cheese or have a little cornbread on the side. Or my favorite, some corn chip scoops. Although this is a typical winter meal, I love to make it during a summer bbq. Chili dog anyone? There are so many options. 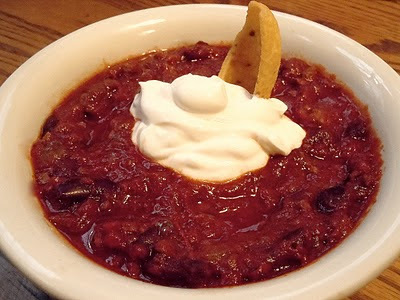 What's your favorite chili dish? Amy, thanks for the follow - following you back! I love slow cooker recipes as I don't use my slow cooker nearly enough. I still have the same one I got for a wedding present 29 years ago, lol! You have a nice blog here, I'm going to go check out your other recipes. Have a great day!